Located at Myrtle Beach National Golf Club, this course was redesigned in 1996 with plenty of clever and fun tricks by “The King”, Arnold Palmer. As an Arnold Palmer design, King’s North continues to be one of the most memorable golf courses. Knowing that location matters, this course is a quick drive from where you are staying whether it's Myrtle Beach or North Myrtle Beach. In addition, this course was recently ranked on Golf Digest’s prestigious list of “America’s 100 Greatest Public Courses”, “Places to Play”, and received a 4.5-Star rating. This is a diverse and playable course that holds a ranking in “Top 100 Courses in America”, by Golf for Women! MBN King’s North, is an 18-hole course with every hole delivering stunning views and lavish greens. To protect the fairways and greens over forty sandy bunkers are strategically placed throughout the course. For a touch of finesse, the 3rd-hole was designed in the shape of South Carolina with deep sandy bunkers and an island green. The 6th-hole is nickname “The Gambler” featuring a risk-reward shortcut to the green. The 12th- hole presents its own challenge- to miss a shot here the penalty is steep. A miss to the left…golfers come face-to-face with South Carolina’s finest bunkers and a miss to the right…say hello to water. Accuracy is required on the 18th-hole. This hole is protected by over forty sand bunkers! It's a course with a lot of character. We really enjoyed the variety of holes. Bit windy today but had a great time! Absolutely great course. It’s in great shape from tee to green. It’s a little crowded and slow but not to the point it ruins the round. Well worth every penny and would definitely recommend it to anyone who hasn’t played it. Kings North a must play in Myrtle beach. Tee box to green great condition. Greens roll fast tricky pin placements each offers a test of your skills this is in the top five. Course in great shape for this time of the year. Fairways were in outstanding shape,the ball sat up like it was on a tee. Highly recommend playing a round here. A real treat for golfers. Course is in tip top shape. Above average difficulty with plenty of waste bunkers and water. Famous hole is number six, The Gambler. Go for the gamble and you have great chance for a birdie. We had an afternoon rate of under $70 which was a great deal. Amazing conditions tee to green. Greens rolling fast and true. Good driving range for a warm up and friendly staff in restaurant and pro shop. Kings North should be a staple of your Myrtle Beach golf trip. Golf course was in excellent condition. Greens are fast and true. Fairways are in great condition but soft, so don't expect to get any roll-out. There is water on 16 of 18 holes that has to be negotiated. Defiantly one of Arnie's signature designs. Lots of Arnie's memorabilia in the club house on display. One side of the building is dedicated to Arnie's success. Nice course. I have been coming here for years and enjoy it every time. The course has some really nice challenges yet fair. The staff are always looking to assist in any way they can. Highly recommended. 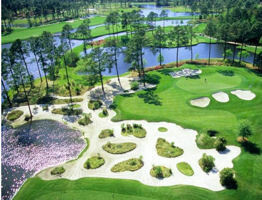 Myrtle Beach National remains one of the finest golf complexes in Myrtle Beach. 3 18 hole courses featuring the North Course designed by Arnie. The West is an easier test of golf for the average player. Club house is well stocked and has welcoming staff to assist you. Guys at the club drop are always friendly and greet you with a smile. Myrtle Beach National remains one of the finest golf complexes in Myrtle Beach. 3 28 hole courses featuring the North Course designed by Arnie. The West is an easier test of golf for the average player. Club house is well stocked and has welcoming staff to assist you. Guys at the club drop are always friendly and greet you with a smile. The best of the best. Great layout, perfect condition. Enjoyable from start to finish. Used to LOVE this course 10 years ago. It WAS immaculate. Came from Utah to play it with my 16 year old for his birthday (10/18/2018). The course was in sad shape- not well kept like it used to be. Cart paths had large holes and bumps and in need of repair. Clubhouse doors were old and worn. The presentation was not close to what it used to be. Very little flowers and staff to maintain the course. I really hope it will return to it's Golf Top 100 courses it was in 2007. It will take a new owner and a lot of time and effort it appears. Until then, not worth $100 bucks. Maybe $50 or 60 at best! Trust me. Go to TPC or somewhere else. Course is in great shape. We played the West course and it is very open allowing for a little better scoring than I'm use to. The greens are in great shape and putt true with some subtle breaks. Staff was friendly and accommodating and the starter threw some jokes into his course description giving us a good laugh right before we started. Definitely want to play this course again. Great course! Still in wonderful condition after hurricane. Could have been 5 stars but they had aerated the back 9 recently and the greens were very sandy. Loved driving g thru the fairway bunkers. The layout is a work of art. The gambler hole, the island par 3, the bunker that rises out of the water on a par 4 right in front of the green. Terrific golf course! Course in good shape was very fun to play lost a star though due to your grounds keeping crew. Might want to inform guy on tractor using blower to wait until people hit. He continued blowing without stopping which was a little frustrating. Other than that hat a wonderful time will probably be back. Played first weekend in August and had a few concerns about the greens I had read on here. Sure, a couple, literally two, were not immaculate, but the great majority of them were in great shape and putted well, especially after the deluge of rain they had been getting. Just a fun course and always in great shape. Located at Myrtle Beach National Golf Club, this course was redesigned in 1996 with plenty of clever and fun tricks by “The King”, Arnold Palmer.